Two conflicts have been running for decades. Now they’re crossing paths for a potentially peaceful resolution. 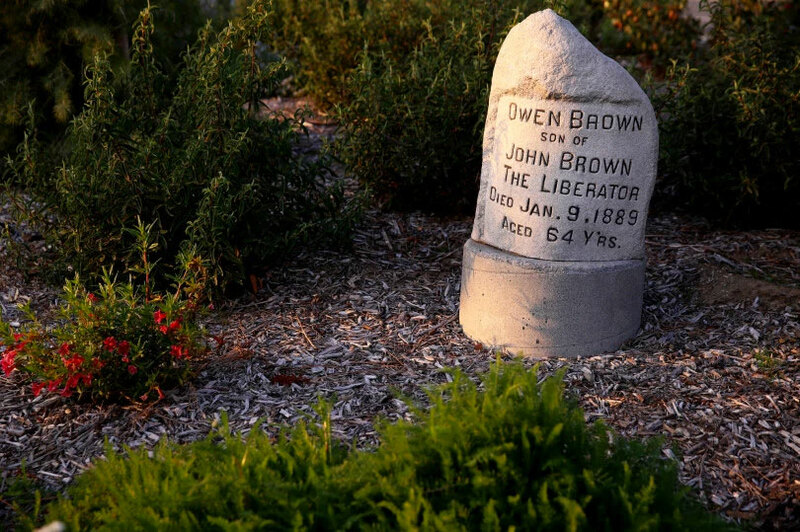 After decades of strife around the preservation of abolitionist Owen Brown’s Altadena grave site and the until-now unrelated battles facing the La Vina development, both projects are finally set for completion in an unexpected crossing of paths for two of this community’s longest running pains. The Los Angeles County Board of Supervisors in November approved a kind of grand compromise hashed out between the developer of La Vina and foes of some aspects of the development, a gated community in Altadena with 271 homes. Tim Cantwell of Cantwell-Anderson Inc. wanted to build out the final 18 single-family lots at La Vina, leaving behind a litany of lawsuits, county investigations and inflamed passions. 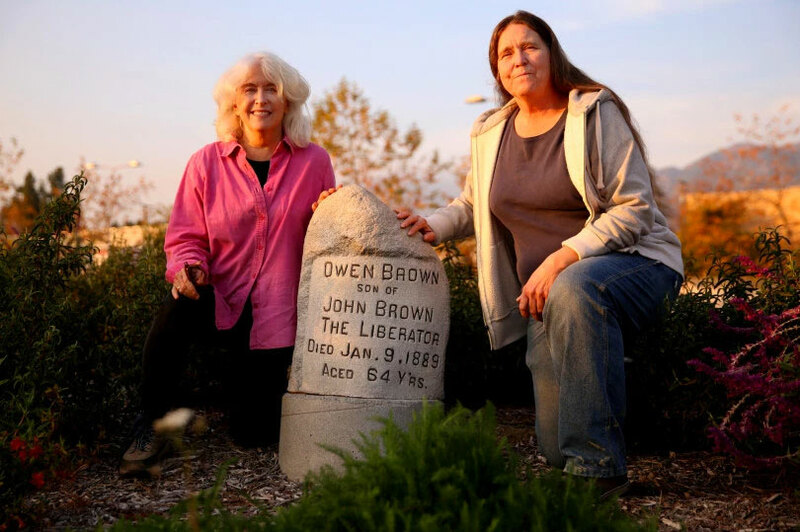 Meanwhile, Altadena preservationists said they wanted to give Brown — son of John Brown, leader of the pre-Civil War raid on Harpers Ferry — the eternal peace and rightful place in local history he deserved. That’s after his grave marker went missing several times and the public was barred access to his northwest Altadena resting place by a private land owner. This is how it all collides: La Vina will be completed; while open, public access to Brown’s grave site should soon be achieved after Cantwell agreed to buy the land, which is not contiguous with La Vina, to preserve it in perpetuity. The sale should be finalized this week. Cantwell also agreed to fund programs to educate locals about Brown and Altadena’s connection to the Civil War and westward expansion, according to Michele Zack, an Altadena historian involved in the pact. She said finding a partner in Cantwell for this effort is a “healing” moment for Altadenans. 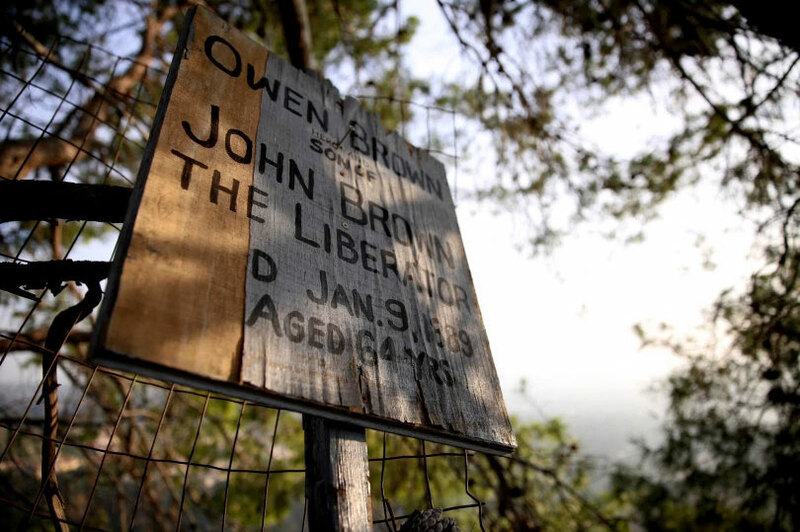 Owen Brown is buried on a 6-acre piece of land at the top of Rising Hill Road near its terminus at the foothills. Some of that land was part of the homestead belonging to Own Brown and his brother Jason Brown and in front of the mountain that would be named after their father, John Brown — a white man whose attempt in 1859 to spark a slave rebellion at the Harper’s Ferry, Virginia arsenal resulted in his hanging for the crime of inciting violent rejection of slavery, according to a history compiled by Zack. Owen Brown was part of the raid too. After escaping and living as a fugitive for two decades, in 1881 he joined his brother and sister Ruth in Pasadena, a community founded a few years earlier by Union supporters and those involved in the temperance movement. His involvement in the raid and his belief in racial equality made Owen Brown a local celebrity. Last week was the 130th anniversary of his death from what was likely pneumonia, Zack said. His grave site went on to become a pilgrimage stop for people of all races who sometimes numbered in the thousands, according to Zack. “They (the Browns) are the collective conscience of the United States that slavery was wrong, that it was inhumane and really that it was against the Constitutional provisions for free people,” said Marietta Kruells, who also worked on securing the agreement with Cantwell. In the 1980s, preservation group Altadena Heritage unsuccessfully attempted to get historical status for the site, a hill known as “Little Roundtop” that overlooks what is now La Vina. 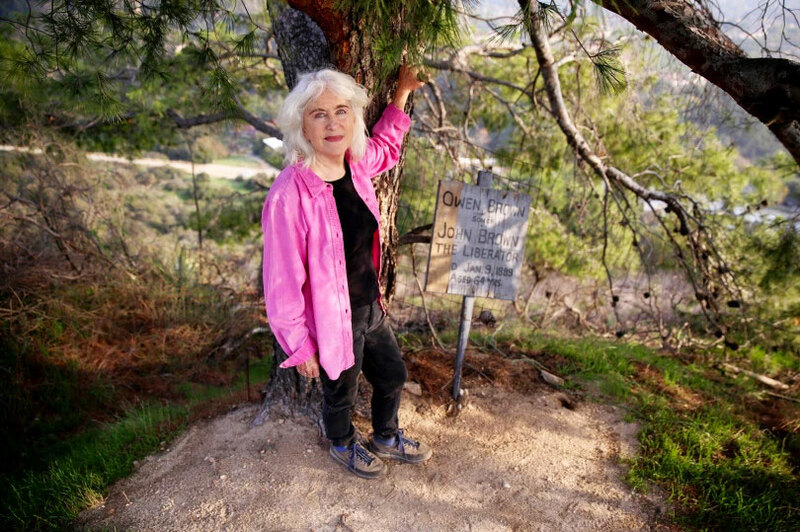 In more recent years, people hiking to the site to pay their respects to Owen Brown were allegedly yelled at by the private landowner — who had posted “No Trespassing” signs on the access trail. The owner, Michael Cichy, lost lawsuits brought against him and judges, as recently as 2006, have twice affirmed that the public has legal access the site. On top of that, the grave marker kept going missing, including in a decadelong stretch that ended in 2012 when the gravestone was found by artist Ian White. White, using his Hollywood connections, commissioned several ear-perfect Fiberglas reproductions of the marker, one of which currently stands at Triangle Park at Altadena Drive and Lake Avenue, Zack said. “The intention is to put it back, the original one,” Kruells said. “But nobody wants to have it lost again.” Today, a wooden sign marks the grave site. The original marker remains stored in a secure location — White and Altadena preservationists knew they needed to put off returning the marker to the grave site until the property had more friendly owners, Zack said. The soon-to-be friendly owner is an unlikely one. “I’ve always been a thorn in the side of Tim Cantwell,” Kruells acknowledged. The La Vina development, named for the tuberculosis sanatorium that once stood nearby, caused division in Altadena even before county supervisors approved it in 1989. Many believed grand homes behind gates were a mismatch for modest Altadena. Trail access remained a perennial conflict — Kruells was one of several parties to bring a lawsuit against the homeowners association in an eventually successful attempt to ensure the project lived up to promises of keeping some land for public conservation. But that represents just some of the trouble La Vina has caused Altadenans over the years. Construction was delayed when one of the builders, Compass Homes, went bankrupt. Residents accused subcontractors of taking appliances and furnishings from the unfinished houses, and Compass was later the subject of a District Attorney’s investigation for allegedly misusing deposits from would-be homeowners. And a 2002 L.A. County audit found trail access was just one of dozens of conditions the project had failed to meet. Officials admitted they should have kept a closer eye on the project. Through the strife, Kruells, Zack and Cantwell now find themselves reaching for a common goal. Kruells and Zack praised Cantwell’s passion for the grave site preservation effort and say they now consider Cantwell a friend. Cantwell did not return several interview requests. The women said he’s traveling out of the state for business. Several years ago, Cantwell approached county officials with a proposal to finish the final segment of La Vina. He wanted to modify original plans that contemplated housing a private school behind the gates — which was unsuccessful — and instead build a slate of additional houses and an athletic center. Kruells and Zack caught wind and suggested Cantwell be forced to meet an alternative condition because the community would no longer be benefiting from a new school, Zack said. A subcommittee of the Altadena Town Council convened to find a compromise, working more than 1 1/2 years before coming to a consensus approved by the supervisors in November. Kruells was appointed to represent the interests of open space preservationists and Zack to represent the interests of Altadena Heritage. Other seats were filled by Town Council members. Cantwell is in the final stages of purchasing the grave site property from Cichy for the purposes of preservation. If the sale falls through, Cantwell will be required to donate an amount of money equivalent to the last offer into a community benefit fund. The idea is that the property will be protected by or given to a conservation group that will protect public access to the site forever and eventually get a historic designation. Zack noted that while access is important, preservationists do not envision turning the site into a tourist area — a steep private road is the primary way to access the winding trail leading to the grave that overlooks El Prieto Canyon on one side and La Vina on the other. Additionally, Cantwell will be required deposit $300,000 into an account that will be managed by a community group to be used for small site improvements and educational initiatives. USC historian Bill Deverell and Zack plan to help develop curriculum and train teachers to integrate Brown’s story into the Civil War, its aftermath and westward expansion. Charles Thomas of Outward Bound Adventure plans to develop a lesson that includes discussion of slavery and the black wilderness experience, according to the project proposal.